Inspect all seat belt assemblies including retractors and attaching hardware after any collision. NISSAN/INFINITI recommends that all seat belt assemblies in use during a collision be replaced unless the collision was minor and the belts show no damage and continue to operate properly. Failure to do so could result in serious personal injury in an accident. Seat belt assemblies not in use during a collision should also be replaced if either damage or improper operation is noted. Seat belt pretensioners should be replaced even if the seat belts are not in use during a frontal collision in which the air bags are deployed. Refer to SRC-16, "Trouble Diagnosis with CONSULT". Fasten the seat belt. Check that seat belt returns smoothly and completely to the retractor. If the webbing does not return smoothly, the cause may be an accumulation of dust or dirt. Use the вЂњSEAT BELT TAPE SETвЂќ and perform the following steps. Apply the tape so that there is no slack or wrinkling. All seat belt retractors are Emergency Locking Retractors (ELR) type. In an emergency (sudden stop) the retractor will lock and prevent the webbing from extending any further. All 3-point type seat belt retractors except the driver seat belt also have an Automatic Locking Retractors (ALR) mode. The ALR mode (also called child restraint mode) is used when installing child seats. The ALR mode is activated when the seat belt is fully extended. When the webbing is then retracted partially, the ALR mode automatically locks the seat belt in a specific position so the webbing cannot be extended any further. To cancel the ALR mode, allow the seat belt to fully wind back into the retractor. Grasp the shoulder webbing and pull forward quickly. The retractor should lock and prevent the belt from extending further. Perform the following test in a safe, open area clear of other vehicles and obstructions (for example, a large, empty parking lot). Road surface must be paved and dry. Do not perform the following test on wet or gravel roads or on public streets and highways. This could result in an accident and serious personal injury. The driver and passenger must be prepared to brace themselves in the event that the retractor does not lock. Fasten driver seat belt. Buckle a passenger into the seat for the belt that is to be tested. Remove the front seat belt retractor. Refer to SB-8, "Removal and Installation". The webbing can be pulled out if the retractor is tilted 15В° degree or less. The webbing can not be pulled out if the retractor is tilted 45В° degrees or more. A and B show tilting angles. Remove the rear seat belt retractor. 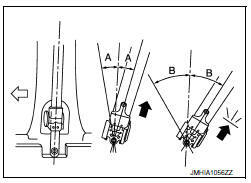 Refer to SB-11, "Removal and Installation - Seat Belt Retractor". The webbing can not be pulled out if the retractor is tilted 35В° degrees or more.